The Jowett Car Club of Australia Incorporated is not responsible for any inaccuracies or changes that may occur within this document. Every effort has been made to ensure total accuracy. It is not a Jowett Car Club publication and, therefore, the Club has no control over its contents. These Technical Notes have been compiled by using the latest information available. Compiled by Mike Allfrey – January, 2006.
a) With respect to later series engines, the banjo fittings for the oil cooler hoses (or side transfer pipe) could leak at their fibre washers. It is best to cure leaks here by using 16 mm Dowty hydraulic type sealing washers. These washers have a flexible seal bonded to their inner diameter. 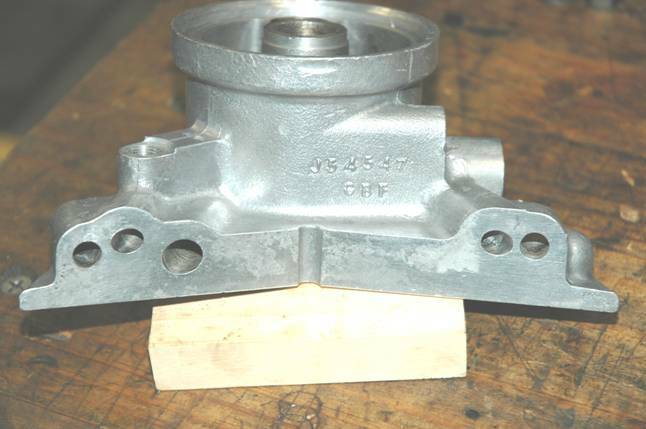 b) The five ¼” BSF bolts along the top of the crankcase joint can leak oil. Often, one half of the set has the bolt holes breaking through the bottom of the face joint. Hot oil can migrate from here along the bolt and out through the split in the spring washer. An effective repair is to use good quality flat washers at both sides in conjunction with Loctite 518 Master Gasket and Nyloc nuts. c) The oil filter drain bolt fibre washer could be leaking. This washer tends to be neglected, and should be replaced with an 8 mm Dowty hydraulic washer..
d) The oil pressure gauge hose connector can leak at the thread in the housing. This can be repaired by cleaning the threads with Loctite 7471 Primer fluid and applying a drop of Loctite 569 Thread Sealant before assembling the connector. e) At the copper pipe olive at the pipe union. In bad cases, the pipe should be renewed. f) The oil filter’s canister sealing ring. g) The two 5/16” BSF bolts that clamp the rear timing cover to the crankcase. These bolts should not be tightened further in an attempt to cure a leak. They should be removed, cleaned and installed using flat washers in place of the spring washers. Use a smear of Loctite 518 Master Gasket under the washers and on the bolt shanks. h) Another common source of an oil leak in this area is where a new gasket has been installed between the rear cover and the crankcase. Usually, this repair has been effected by taking a short cut in not removing the timing cover. The front cover’s gasket is cut and a new top portion inserted. This is never successful. 1. Remove the engine oil sump, timing cover and rear timing cover. 2. Remove the oil filter canister. 3. Ensure that all joining components are free of burrs and are cleaned with Loctite Primer 7471. Primer 7471 should be wet sprayed on to the component surfaces and then wiped dry with a clean cloth, Primer 7471 is then sprayed on again and left for twenty minutes to half an hour to etch the surfaces ready for Loctite 515 Master Gasket. Methylated spirits, used after the Loctite cleaning fluid, will retard the curing process. 4. The gasket, part number 50692 or J54688, should also be cleaned in the same manner as the other parts. It is a good idea to check that the front edge of the gasket protrudes forward of the rear timing cover and the crankcase face by at least 0.002”. This is necessary to ensure that there is an oil tight seal at the front timing cover gasket. 5. Cut a piece of 5 mm diameter ‘O’ ring cord to fit into the recess at the centreline of the rear timing cover’s gasket surface. Slice off a longitudinal strip so that there is a flat edge. The finished piece should be proud towards the gasket surface so that it is crushed to fill the void. Use Superglue to attach this strip to the rear cover. 6. A thin smear of Loctite 515 Master Gasket should be applied to the gasket on both faces. The rear timing cover, less the oil filter canister, is then bolted lightly and evenly to the crankcase. Do not permit the Loctite 515 Master Gasket to squeeze into the oil galleries. 7. The front timing cover, less its gasket, should then bolted to the crankcase – with these bolts firmly tightened. The upper five bolts are then installed into the rear timing cover to just hold it forward. The two vertical bolts should then be fully tightened. Then the front bolts into the rear timing cover are fully tightened. This assembly should be left overnight to fully cure. 8. The front timing cover should then be removed and normal engine reassembly procedure adopted. Always make sure that there is front timing cover gasket protrusion at the sump face, to effect a proper seal here. 9. There is a chance of oil leakage at some of the front timing cover securing bolts. This is particularly so with respect to those bolts in the vicinity of the petrol pump. There is a simple method to ensure no leaks. Make sure that the bolts are absolutely clean. Make sure that the holes in the timing cover are also clean. Do not use spring washers under the bolt heads, use a small outside diameter plain washer. Apply a smear of Loctite 518 Master Gasket to the bolt and the washer. Apply a thin smear of Penrite Copper Eze to the bolt threads. Tighten bolts evenly in sequence and wipe away any excess sealant that may have been squeezed out. The sealant will hold the bolts securely. Using the aforementioned procedure, will usually effect a sound repair. 1. From 2 mm thick flat aluminium plate make up a substitute gasket, ensuring that there is extra material along the rear edge. 2. Carefully mark out the two holes for the 5/16” BSF bolts and drill with a 21/64” diameter drill. 3. Make dimensional checks of the oil gallery positions in the crankcase set and the rear timing cover. If they match, all is well. If they do not match, the crankcase can be modified by counter boring the drilling that is out of position to a depth of 10 mm. The diameter of the counter bore should be such that the repositioned drilling fits into the counter bore diameter. A plug should be machined so that it is a tight fit into the counter bore. Install the plug, using Loctite 680 Retainer. Machine the plug flush with the gasket face. Carefully mark out the revised position of the oil gallery drilling and drill through the plug. De-burr the hole. 4. Mark out the oil gallery drillings in the 2 mm aluminium plate and drill the oil supply hole with a 16 mm diameter drill. Drill the two distribution gallery holes with a 14 mm diameter drill. Make sure that the aluminium plate, when bolted in place, is absolutely flush with the front face of the crankcase set. 5. Obtain one 16 mm OD ‘O’ ring and two 14 mm OD ‘O’ rings. The ‘O’ rings should have at least 1 mm of crush when installed. 6. Cleanly form a bend in the plate to match the angle of the top face of the crankcase set. 7. Trial assemble the components to make sure that the upper five front timing cover bolts will thread into the rear cover while it is located on the 2 mm plate. Do not force these bolts, remove the timing cover and drill the holes 1/64" larger. Make sure that the plate is flush with the crankcase front face. 8. Thoroughly clean all components and prepare for Loctite sealant use. 9. Insert the ‘O’ rings into the plate and apply a thin film of Loctite 518 Master Gasket to both faces of the aluminium plate. 10. Apply Loctite 518 to the two 5/16” BSF bolts and their flat washers. 11. Assemble the components as described for replacing the standard gasket. Note: It is every Javelin and Jupiter owner’s ambition to have an oil leak free engine. Rusting engine bolt heads are proof of such a situation!